Here in our small hometown we take great pride in our local art museum. As the first visual fine arts museum in Utah, it has served as a cultural hub in our community for decades! Dedicated in 1937 "as a 'Sanctuary of Beauty and a Temple of Contemplation' by David O. McKay, the Springville Museum of Art houses over 2,500 works. With over 15 exhibitions annually, the Museum is a key promoter and contributor to the arts in Utah. Artwork is displayed throughout 29 galleries in this 45,000 square foot facility and a beautiful outdoor sculpture garden." Being as it is located just down the street from the Corn Wagon we get especially excited each year for the annual Quilt Show. 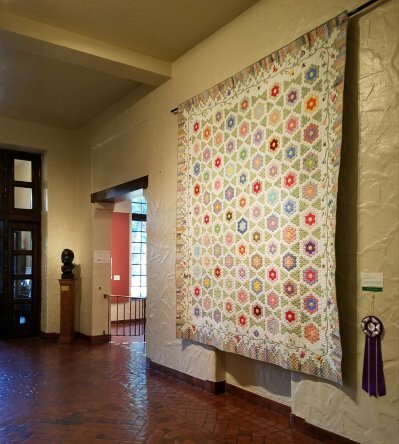 This juried exhibition features quilts of all styles; from traditional hand piecing to modern textile art ranging in size from mere inches to pieces that span nearly floor to ceiling. Each year some of Utah's best quilters are selected and featured after a vigorous screening process by a panel of quilting experts. I had a few moments yesterday to browse through this year's show and as always, came away inspired and in awe of the local talent that surrounds us. 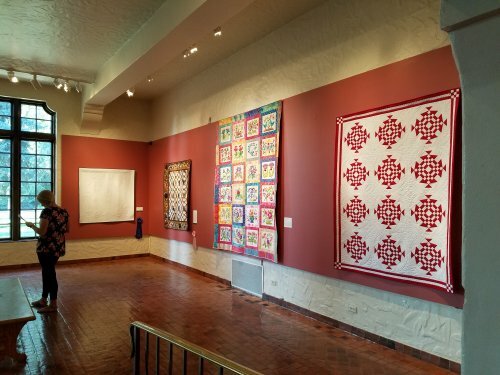 Take some time in the coming weeks, whether it's just 20 minutes or a couple of hours, to find out why Springville is called "The Art City" and fill your heart with some spectacular quilted goodness. When you hear the name Sue Spargo, what do you think of? 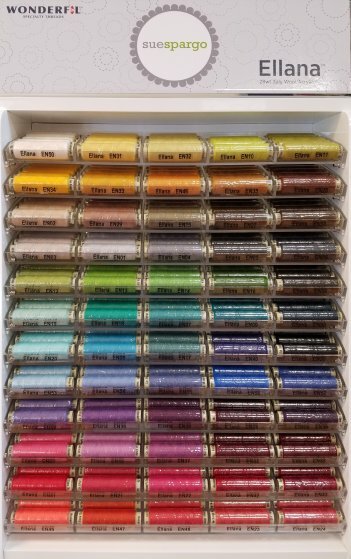 Bold, saturated color, layered texture, wonderfully unique designs embellished with the most beautiful stitches... We are happy to add Sue's gorgeous rainbow of wool floss to our growing collection of her threads! These spools are a great size (smaller than our usual spools but larger than our bobbins) and excellent quality. Add a few new Ellana wool floss colors to your wool applique basket. We also carry her full line of Eleganza pearl cotton and select Dazzle embellishment threads! Soooooo many great Christmas lines this year! We had a hard time choosing which ones to order so we got them all (or so it seems)! 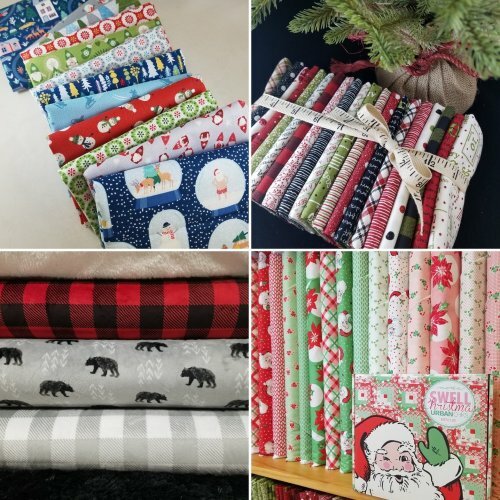 We have an entire wall dedicated to Christmas fabric here at the shop and we've already seen many of you in with your Christmas gifts in the works - stockings, PJs, Cuddle throws, gift bags, advent calendars and of course QUILTS! These are just a few of the winter themed fabrics new to the shop. Hygge Christmas by Lewis & Irene is fun mixed with Waiting for Santa by Dear Stella Designs. The long awaited Overnight Delivery by Sweetwater and Swell Christmas by Urban Chiks has arrived! And the project I am dying to begin for the guys on my gift list... NEW Barefoot and Buffalo Check Cuddle looks fantastic paired with Cuddle Sherpa and Shag! August 13th - 25% off Moda Precuts including all regular price jellyrolls, layer cakes & charm packs! Join our FREE handwork club! This gathering is for those who know the basics of hand applique or want to learn to hand piece. We will work together to improve our hand applique and hand piecing skills and get our own projects completed with a fun group of sewing friends! August 14th 1 p.m. - 4 p.m. Wool stitchers and wool rug-hookers, UNITE! Join our wool club to work on your own projects and get help when you need it here at the shop every 2nd Tuesday, 1 p.m. - 4 p.m. Receive a coupon for a FREE dozen ears of Harward Farms Sweet Corn with your purchase of $10 or more in merchandise here at the Corn Wagon Quilt Co.! Coupon redeemable only at the Harward Farms produce stand across the street from our shop near the corner of 400 S 400 E during business hours 08/18/18. Saturday, August 18th 10 a.m. - 1 p.m.
With a quilted base for stability and a see-through vinyl top so you can say “hello” to all your treasured trinkets, you’ll want to make all four sizes of these adorable zippered pouches! Shelley Taylor will teach you every step of the way here at the shop. Class Fee: $20.00 - Pattern and supplies purchased separately. Register here on our website, in-store or by phone.